In celebration of Slow Art Day, we’ve invited four special guests to commandeer SFMOMA’s Twitter account for 30 minutes of live tweeting from the galleries. Yesterday artist Gay Outlaw took the reins to talk about Trisha Donnelly — enjoy the transcript! I want to hang out with whoever is running @SFMOMA right now. 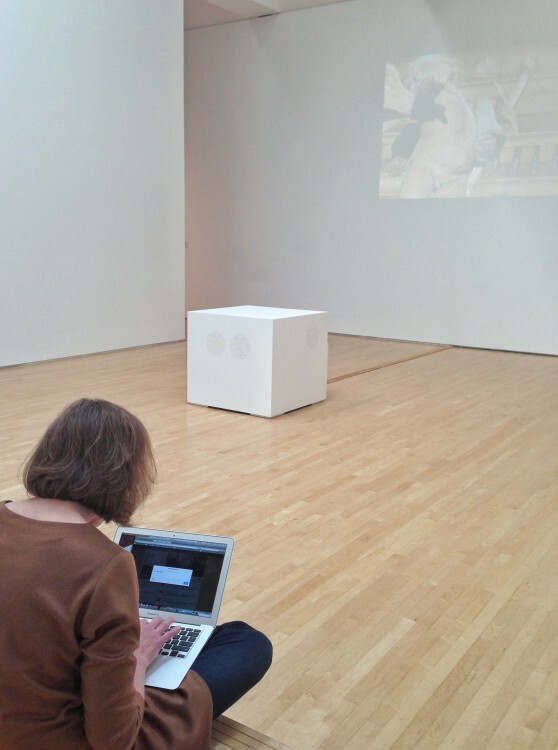 Wonder who #hacked @sfmoma's #TwitterFeed? : "This is an intimidating situation. I've been set free! I've been set free?" Hilarity to ensue. I'm in trouble, Gay Outlaw's takeover of the @SFMOMA account is completely engrossing and I've got work to do! it’s always fascinating to hear a conceptual artist describe a minimalist’s work. and i love being in Outlaw’s head! In the room with the benches and the prints and the big projector, there is a small block of wood sitting on the floor kind of in the corner, jutting out from the wall that is being projected on. Is this block of wood part of the gallery or part of the exhibition?